For three decades years Ed Graham, Superintendent at Cranshaw Construction, has relied on Babfar temporary heaters. But how do you know you’ll get a quick turnaround time before you experience a problem? Graham suggests using four criteria when evaluating temporary heating vendors. Heating companies should be available 24 hours a day and respond immediately to questions and problems. 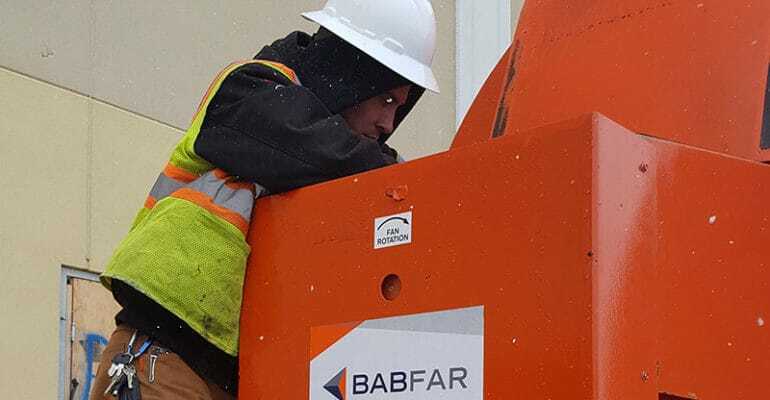 “Babfar’s owner puts a label with his mobile phone number on every heater,” says Graham. “If needed, I know I can reach him any day, any time.” Look for similar indications that a company makes it easy for you to get support. Find out who will be your point of contact? Where do you call for help? A quick response time is a good start. Ultimately, you want issues resolved ASAP. “The few times we had issues, Babfar got the heaters firing again in 3 – 4 hours,” Graham says. Without the benefit of this kind of experience, you can ask vendors how quickly they resolve issues in the field. You can also ask their customers how long it takes the vendor to make repairs. An essential part of resolution time is having spare parts in the field. “One time we had an issue with a discharge fan. Within 3 hours a tech came to service the unit,” recalls Graham. Because his service truck carried spare parts inventory, the technician didn’t waste time going back to Babfar to get the part he needed. “The tech installed a new fan he had in his truck, and the unit was up and running, again,” says Graham. To minimize downtime, make sure your vendor maintains an inventory of spare parts in service trucks. Ask if they have had to replace the units in the past. This time-consuming approach to making repairs, might be a sign that the company does not stock spare parts. Sometimes a problem is easy to fix. “A lay person can do a lot of work if the units are simple and straightforward,” says Graham. End users can check lots of things on their own, which saves time. Maybe dirt over the safety’s sensor needs to be removed to get the burner going again. Or the starter electrodes need to be repositioned to get a spark. “One time, I was able to troubleshoot a unit while on the phone with Babfar,” recalls Graham. “The control system is easy to figure out.” Before renting heaters, ask the vendor to give you a quick training on their units. Making sure you’re comfortable starting the unit, and doing basic troubleshooting.